by Brianna Crandall — November 9, 2018 — On the final day of the ISSA Show North America 2018 last week in Dallas, Texas, worldwide cleaning industry association ISSA announced the winner of the 2018 ISSA Innovation of the Year Award. The award program is a platform to gather and recognize the cleaning industry’s most innovative products and services from top manufacturers and suppliers. EvoClean does not require squeeze tubes, which helps drive down maintenance costs. The system employs an eductor that restricts water flow to 0.5 GPM or 1.0 GPM (nominally) and forgoes the use of AC and DC motors, which require more power to operate. 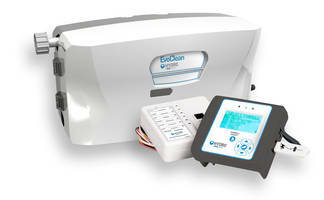 It can deliver three to eight chemical products, and is designed not to drift or under-dose chemicals due to squeeze tube wear, reducing downtime and providing predictable results with every wash.
EvoClean is 50 percent lighter than other traditional peristaltic pumps and takes up less space within a laundry facility, leading to simplified installation and maintenance. The system is available in four, six and eight product configurations for two flow rates. It is also compatible with Hydro Systems’ Total Eclipse Controller, which features a 20-formula capacity and Auto Formula Select, along with a large LCD that displays formula names, dispenser status and various diagnostic reports. Users can access reports on product usage, costs per formula, system settings and more through the controller. Tork PeakServe Continuous Towel Refill and System by Essity Professional Hygiene North America LLC. Cheers to Hydro Systems for taking the top spot amidst so many great entries. All of us at ISSA are proud to recognize Hydro Systems, as well as this year’s Honorable Mention and Category Award winners [see below], and all of the fantastic achievements made by the companies that entered this year’s program that are doing so much for the advancement of our industry. The winner of the prestigious 2018 ISSA Innovation of the Year Award was selected by combining the results of the online voting with the evaluations of an esteemed panel of judges, all respected leaders in the commercial cleaning industry. The winners of the ISSA Innovation Category Awards were announced just prior to the show. One winner was selected from each category by way of online votes cast by cleaning-industry professionals. Cleaning Agents: Enviro-Solutions Terrazzo and Concrete Floor Care Program by Charlotte Products Ltd.
For more details about the 2018 entries in each category, visit the ISSA Show website.